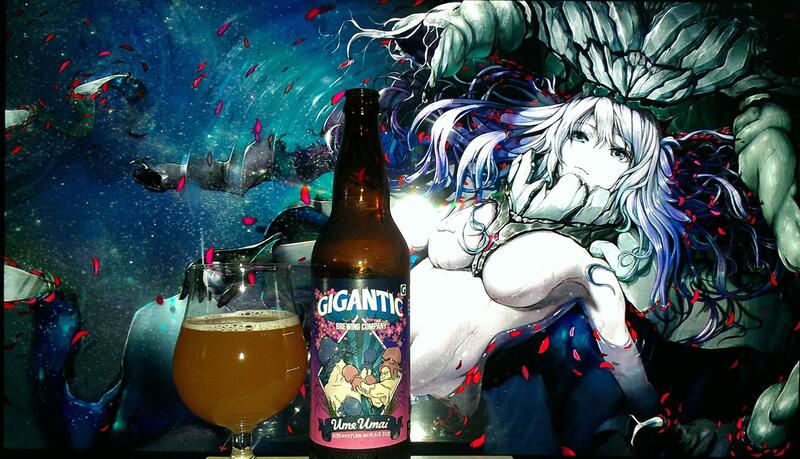 Beer #88 Ginormous by Gigantic brewing is an 8.8% ABV Imperial IPA. Developed in a secret testing facility deep in S.E. Portland Ginormous is powered by Seven Mighty Hops. His Mission is simple; To deliver a massive hop punch to those in need. 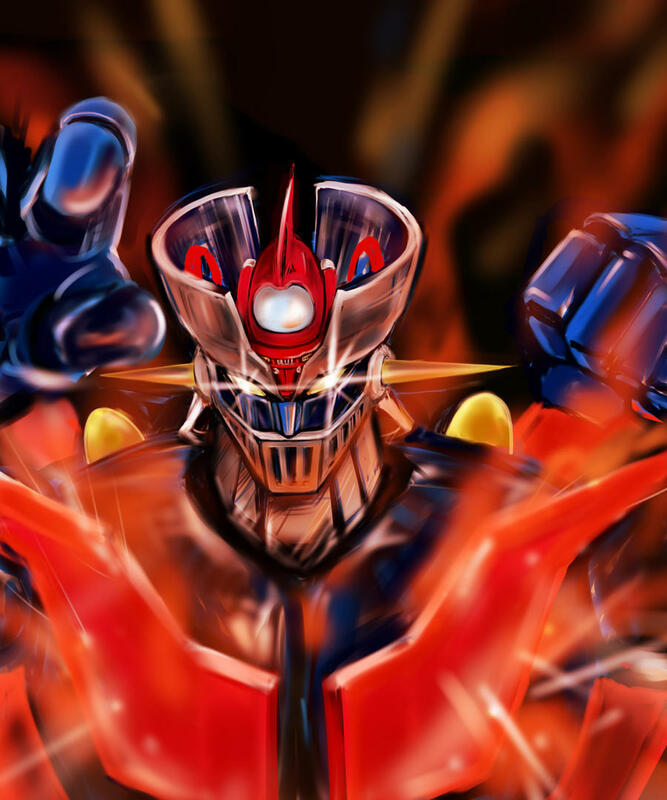 Mazinger!!!! 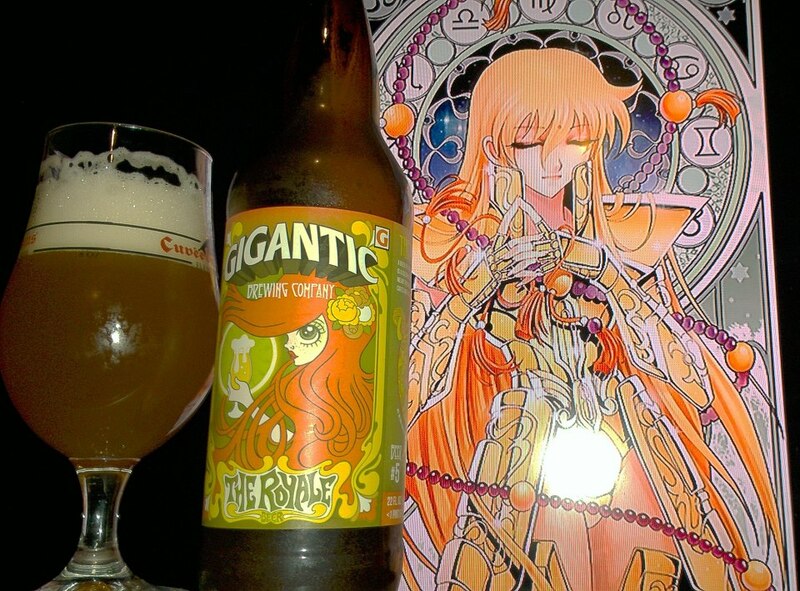 Finally, an anime tribute beer. A tribute to the classic series Mazinger Z where the hero fights other aliens and robots using a super robot he commands from his ship that attaches to the head of the robot. Kinda how hops invade the brains of craftbeer lovers and make everyone hop heads. I see what ya did there Gigantic, Good Game… Good Game. 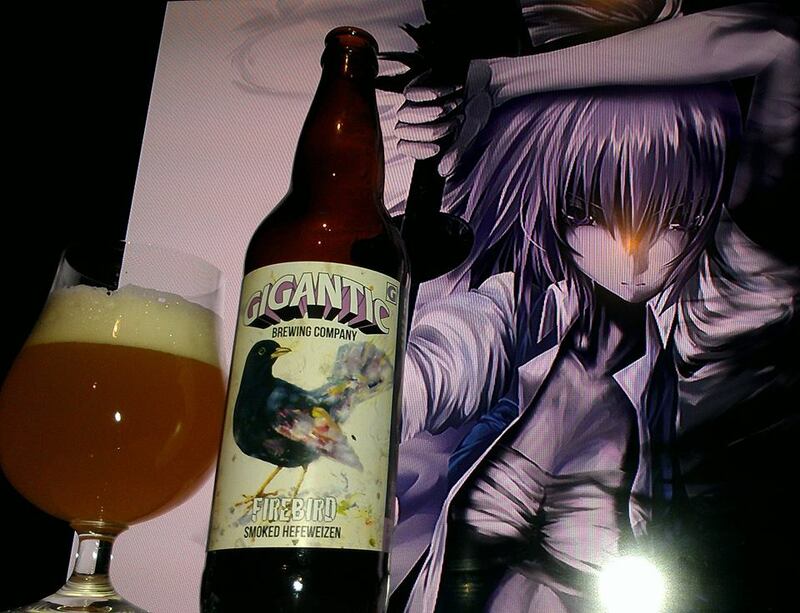 Eitherway, I figure I bring it to the site being anime beer and all that. Let’s see what kind of beer this brew is exactly. Cheers! Citrus, Oranges, caramel, toffee, tangerines, juicy fruit starburst, Grapefruit, piney, floral, citrus, herbal, grassy, hops, tropical hints of fruit kiwi, dragon fruit, passion fruit, lychee, guava, mango, biscuit bread, marzipan, cane sugar, wafflecone hints, stone fruit peach hints and brown sugar. Grapefruit, piney, floral, citrus, herbal, grassy, hops, tangerines, juicy fruit starburst, tropical fruit notes of kiwi, dragon fruit, passion fruit, lychee, guava, mango, lemon grass, mandarin orange gummy bears, orange peel, raspberries, papaya, strawberries, honey, biscuit bread, marzipan, cane sugar, wafflecone hints, caramel, toffee, stone fruit peach hints and berry flavors. Dank herbal, rich citrus, tangerines, coriander hints, tropical fruits, stone fruits and piney hop notes. No alcohol in the taste, Clear honey golden body, rich, crisp, refreshing and delicious mouthfeel with an easy to moderate drinkability. A very good IPA leaning more toward the citrucy caramel side than the super grassy or super tropics. 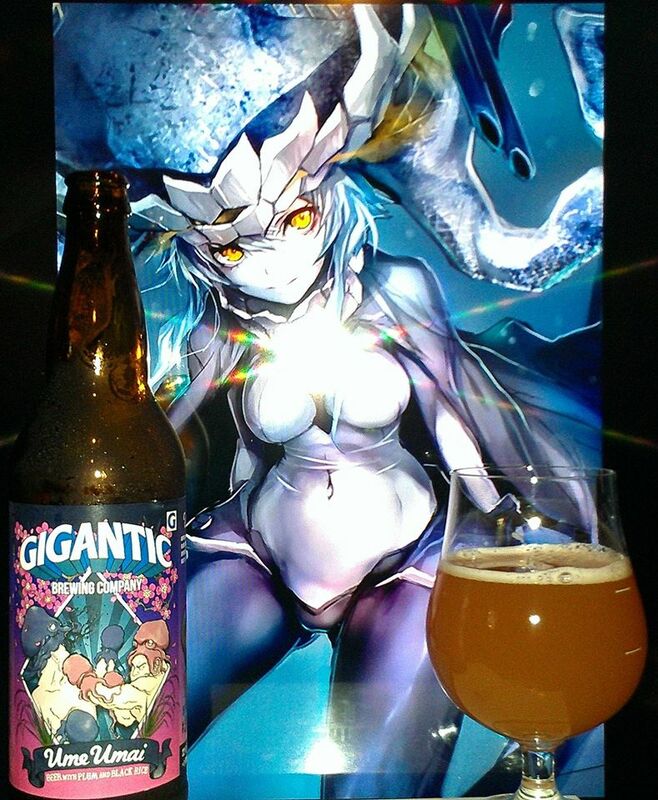 A very enjoyable double IPA that pays tribute to anime. 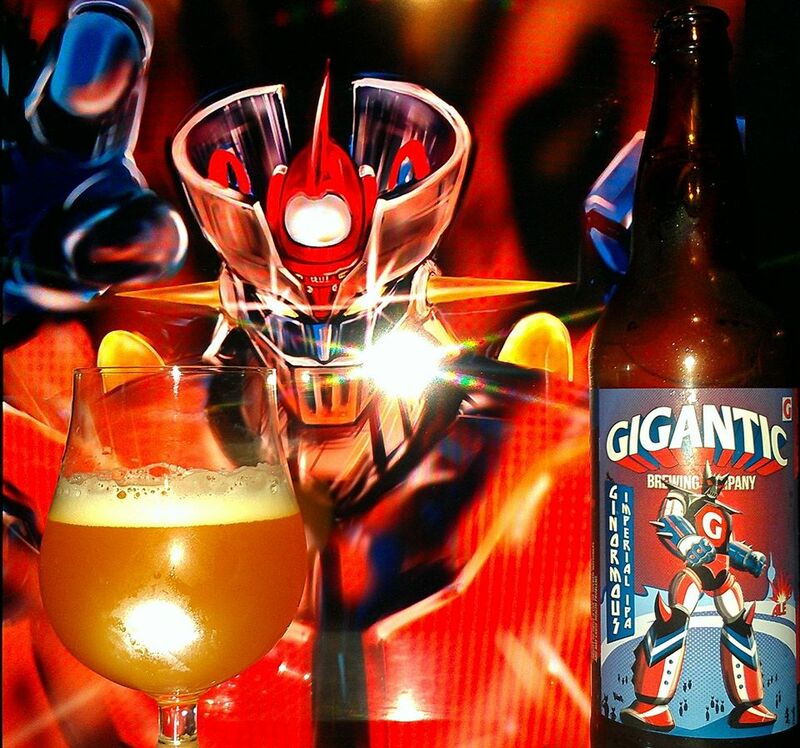 It is awesome to know how many craftbrewers come from a range of passions ranging from video games, comics, anime, sports, music, fishing and other hobbies leading to infuse their passion with other things. 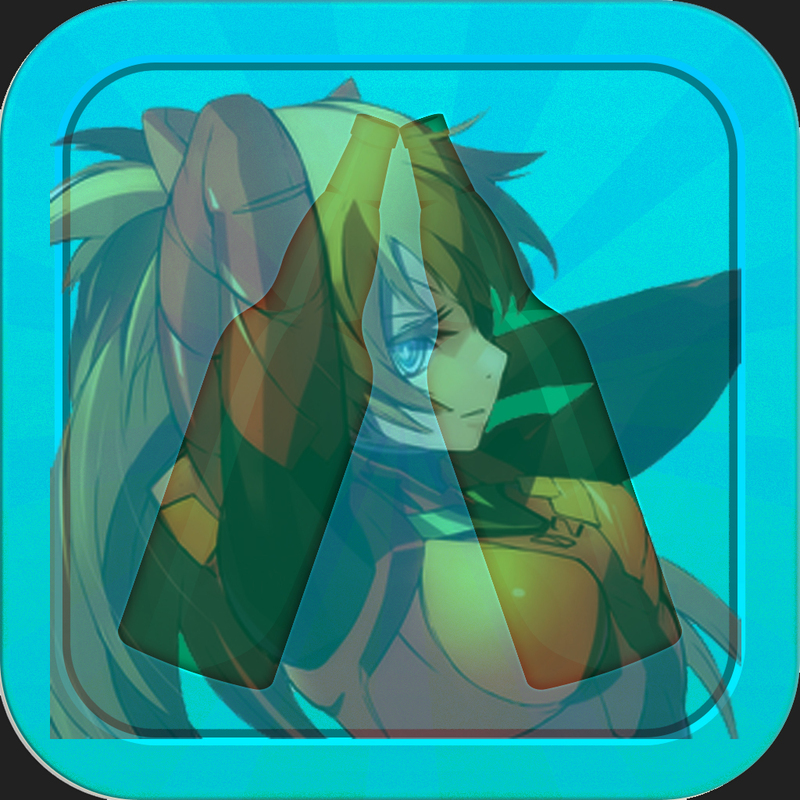 Kinda like this website . 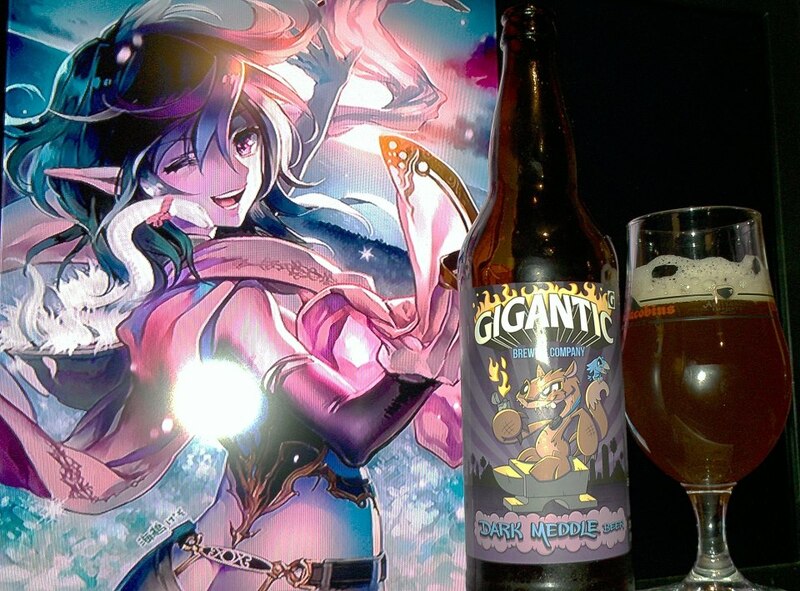 Anyway, This one is very good and definitely recommended if you love IPAs and Anime. 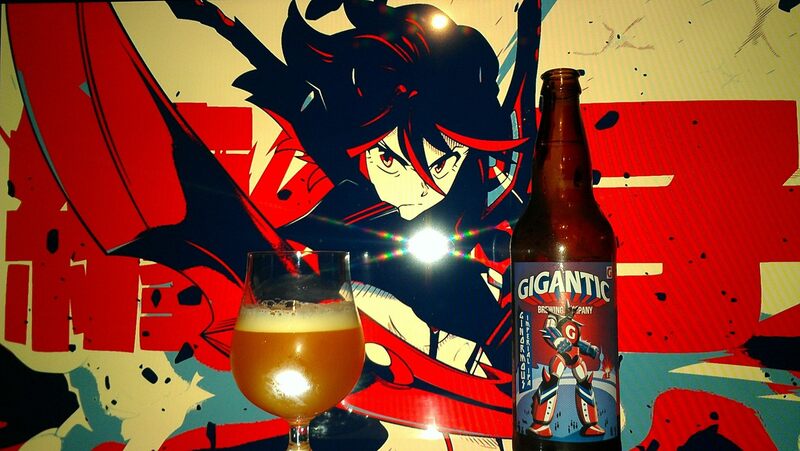 Ryuko Matoi from Kill La Kill and Mazinger Z were used in this pairing for the colors of the label but also the theme of the beer. 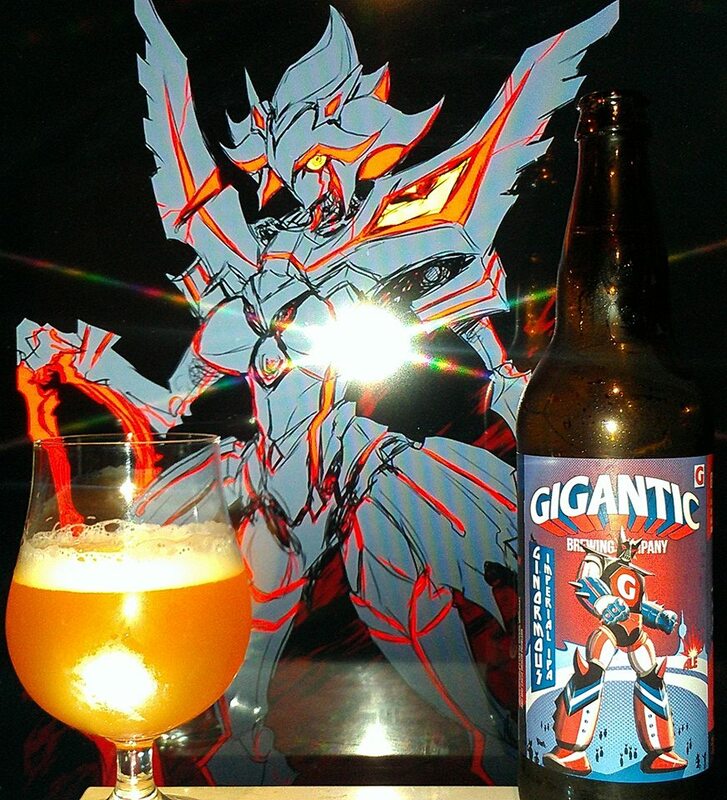 Since this is a Mazinger beer, I wanted to with him but also since Ryuko has some colors to complement with Mazinger, I figured it was for the best. 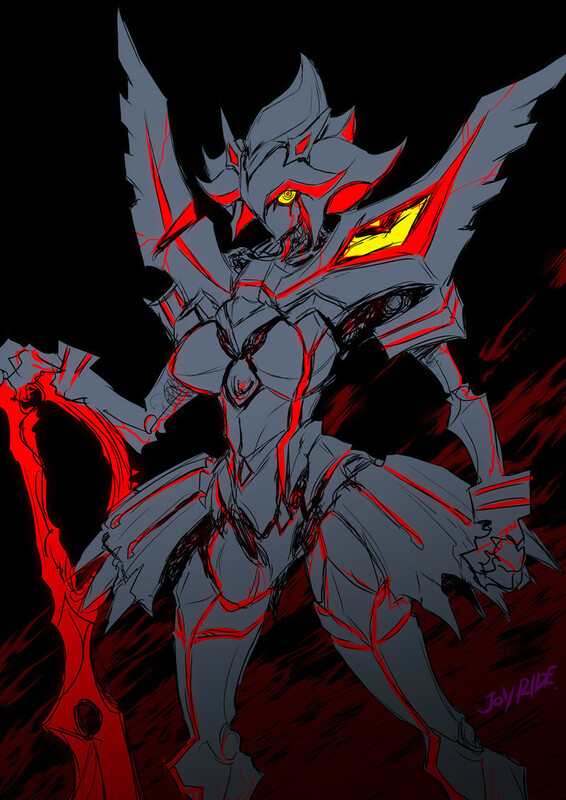 Ryuko’s design is based on old school anime, especially the hair. Frilly and psychedelic. Either way, a good tribute to the first cartoons of my childhood mixing with one of my favorite anime characters, Huzzah!! 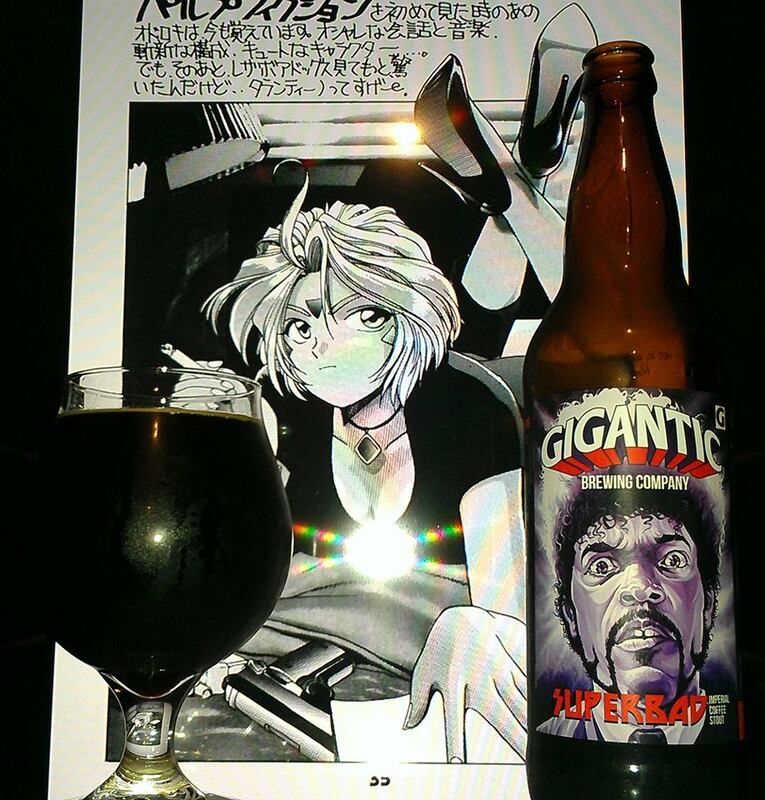 Beer# 31 Ume Umai (Delicious Plum) by Gigantic brewing is a 7.5% ABV Specialty Grain Ale brewed with Plums and Black Rice. Inspireed by the Japanese flavor palette, we combined plums, black rice and pilsner to make a unique beer experience. Brewed “Dry” in the asian manner, Ume Umai is fruity yet earthy and above all, refreshing and delicious. 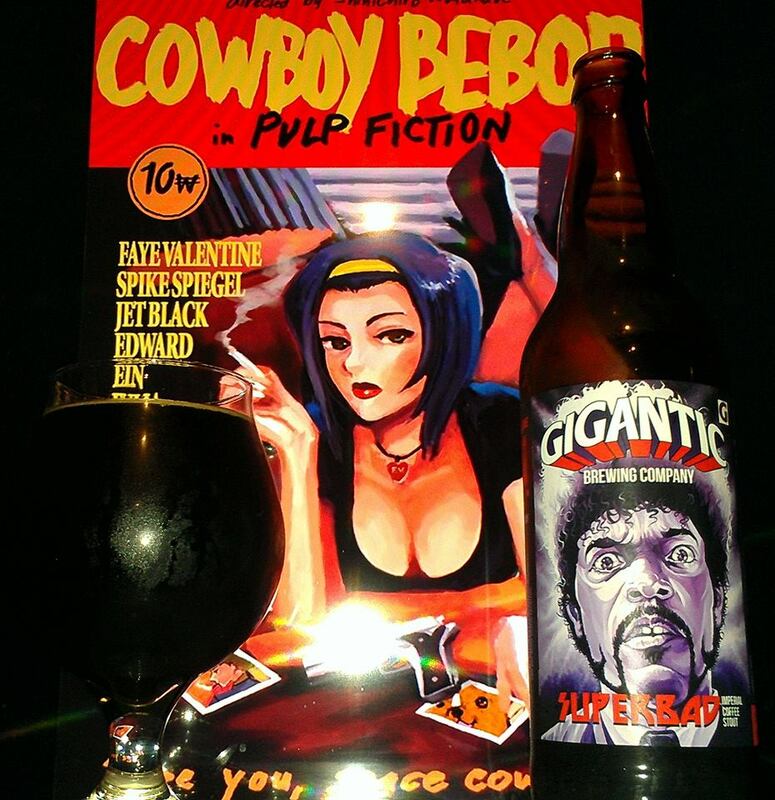 Its been a long time for a Gigantic beer review. I don’t often get a chance to try their beers but they have been coming out more frequently however. 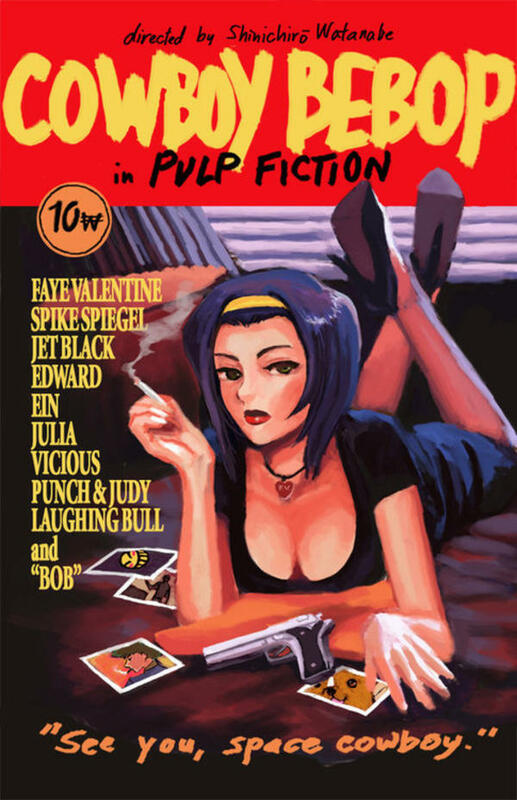 Which hopefully I will be trying more if something intrigues my eyes. Ume Umai or Japanese for “Delicious Plum” is the beer I bring forth. With Plum and Black Rice or Forbidden rice which is mainly native to countries such as China, Thailand and Indonesia. An interesting ingredient at that and some forms of this rice comes in like a purple color. Plum soda, Sake hints, Red bean ice cream mochi balls, peppercorn spice, caramel, vanilla, bubble gum, clove spice, bananas, oranges, Lychee fruit, Coriander spice, sakura cakes, ginger spice hints, grape skins, guava notes, lavender, sweet rice balls, cane sugar, apples, floral hops and cereal grain. Oranges, Lychee fruit, Coriander spice, Rice pudding, stone fruit peaches, apricots, dark fruit plums, Red bean ice cream mochi balls, peppercorn spice, caramel, vanilla, bubble gum, clove spice, bananas, rice cakes, sakura cakes, ginger spice hints, grape skins, guava notes, sake notes, sweet rice balls, cane sugar, apples, floral hops, hibiscus, lavender hints, sweetened condensed milk, biscuit bread, plum sauce and cereal grain. Leaving traces of dark fruits, stone fruits, hints of tropics, earthy notes, rice pudding, sakura cakes and coriander spice with oranges. No alcohol in the taste, cloudy full golden body, creamy, crispt, effervescent and full mouthfeel and a moderate drinkability. 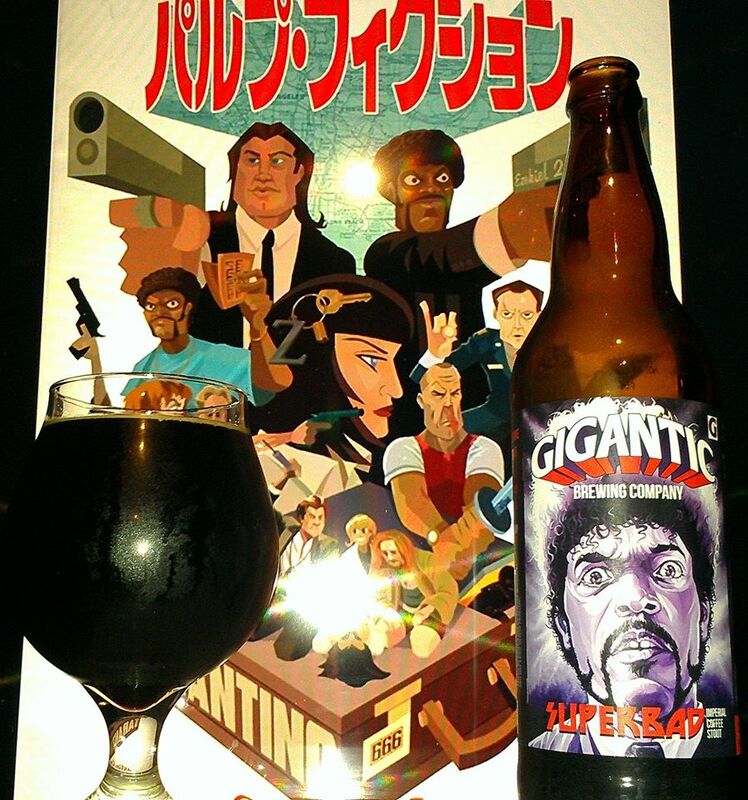 Very good brew with some very Japanese like flavors especially the rice dessert flavors. With the plum combination, this turned out to be very sweet and interesting. Being a smooth and lagerish like beer full of a complex flavor that was definitely worthy of merits. While it was not super boastful in its flavors as it was not head on fruits but lightly noted, it definitely gave it some credit for being above refreshing. Worth a try and maybe more. Wo-Class from Kancolle/Kantai Collection was used in this pairing since I wanted to pair a character that has an octopus or some kind of tentacle monster on their head and went well with the flavors and ingredients of the beer like the color of the dark fruits and plums as well as the rice patties from where the black rice came from. Simply put, pairing that works with the beer label and flavors and colors. A beer fit for sophisticates and flaneurs, The Royale is a golden concoction of fruity and citrusy flavors meant for whiling away one’s time in brasseries, cafes and pubs, or anywhere friends can be found. The aromas of this beer are of yeast bread and grassy hops with fragrances of banana, grapefruit, citrus, grassy herbs, spices, fruity esters, floral almost like a saison and farmhouse ale. Reminiscent of the the Eschatological and the Bitter Monk. The flavors are of grassy, grapefruit and pineapple hops, citrus, banana bread, biscuit, pears, apples, grapes and flowers. It is a great beer if you can find it. However, if you can find the other BPAs even better. It is an awesome example of a Belgian Pale Ale and truly delicious. Maybe not blow your mind delicious but is still great.